Which TIME are you in right now? The well-read passage from Ecclesiastes 3 is one which has influenced people throughout the generations. It covers everything that we will experience in our life-time and perhaps even more. I have found that every time I get to read these words from Solomon they speak to me, because I find I am “in a different place” or time. I believe it is the nature of the Spirit to highlight a particular moment in TIME for us - or to reveal where we are at in life. 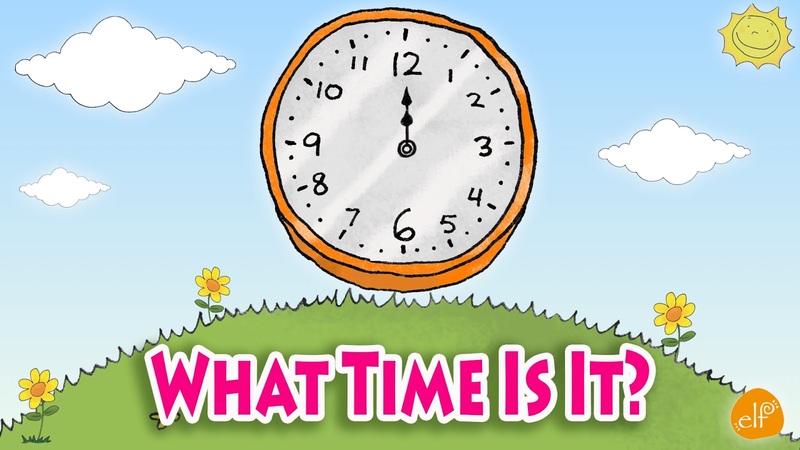 So I wanted to ask you to think about which "TIME" you are in today? Are you in a season of…? The Good News is that all these seasons don’t last forever, so if you are in a very bad place right now, don’t despair because God can turn the seasons around. Just trust in Him and listen to his wisdom. 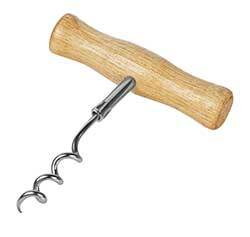 Life is like a cork-screw sometimes - a cork-screw that can't be straightened. Well that is what Solomon suggests in Ecclesiastes - and I tend to agree with him (in part.) There are some things that happen to us, that leave us feeling a little 'bent out of shape' and we wonder how things will come right again. I am grateful that God always seeks to make things 'whole' again and that even when life gets tough, God's help is at hand. 12-14 Call me “the Quester.” I’ve been king over Israel in Jerusalem. I looked most carefully into everything, searched out all that is done on this earth. And let me tell you, there’s not much to write home about. God hasn’t made it easy for us. I’ve seen it all and it’s nothing but smoke—smoke, and spitting into the wind. Don't forget that God is always on our side, even when life gets you down. 1. 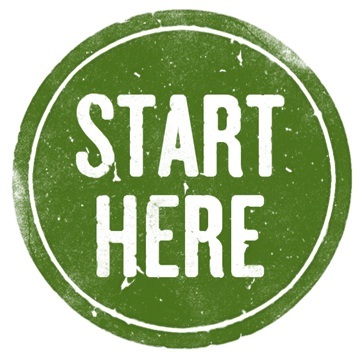 Everything we do should start with God. So often God becomes our stop-gap when everything else seems to fail, but we need to remember to go to GOD first. 2. Our parents taught us many things and we should heed their advice. Of course, no parent is perfect, but we would do well to listen to Godly advice from our close family members. 3. Put wise counsel on the "outside" of your daily living - in other words, remember it! Put it in your hair or on your fingers if it helps you remember the wise of the godly. Apologies for the long absence from the daily blogs, but I have been on a much needed Sabbatical - I am sorry for not giving you all warning about missing the posts - I had actually hoped to write a few while I was away, but that never materialised. Apologies again. We have been on a wonderful road trip as a family, taking in some truly incredible sights of South Africa. The one thing I am convinced of is this - We live in a beautiful country! As we spent time soaking in the breath-taking Blyde River Canyon, God's Window, Kruger Park and Mabibi it left me in awe of our God. Genesis 1:31 - "God saw all that he had made, and it was very good." When we think that we have all bases covered and we are confident in our own ability, that is when we are walking on thin ice. The wisdom of our own 'eyes' can be very different from what God requires of us. This is the warning that comes from Solomon in Proverbs 3. I have also learnt over the years to ask for wisdom from Godly people. It is amazing how God speaks through his servants. If you are in a tight spot today, ask God to guide you and TRUST in the Lord to get your through this tough time. Don't rely on your wisdom, but lean on God's understanding. 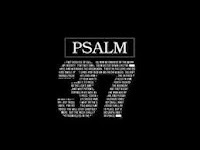 The last 5 Psalms, recorded in the Bible, all contain 3 very simple, yet profoundly powerful words - PRAISE THE LORD. In fact, if you read these Psalms now you will note that they all finish with the same 3 words - it is a call for us to offer Praise to our King. 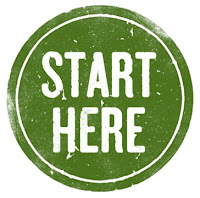 It is not a question of suggestion or "if we have had a good day", but rather an act of Faith. When we proclaim the three words - PRAISE THE LORD, we are showing our allegiance and respect to our Lord. I think that this is a call for us, even when things don't work out for us, because it reminds us that God is still on our side and that he will fight for us. So, if you say these 3 words with me today, you will be acknowledging who your master is and that you trust in God's great hand to be with you. Have you ever got yourself lost? So, lost that you have had to rely on someone else to point you in the right direction? I know that this has happened to me on more than one occasion - it is quite unnerving don't you think? There will come a time in your life where you will need someone to point you in the right direction. I am thankful that God has shown me the way to go and has offered his Spirit to guide me through the obstacles of life. If you are finding yourself feeling a little lost today, then please ask God to guide you - I am sure that he will cast some light on your path. Psalm 119:105 - Your word is a lamp unto my feet and a light for my path. It is not often that you find a compassionate ruler. Being compassionate can be seen as a sign of weakness, yet in this case, it reveals the great strength of God. When it is well within God's power to be vengeful or harsh, he shows his great love for humanity in his mercy. It saddens me when I hear of people speaking of God only as an angry God or as someone who delights in putting people in their place. Do these words sound like someone who is angry? Just as our Lord is compassionate, let us show compassion to those who need it. We spend far to much time worrying about other people and what is going on in their lives, that we get side-tracked from dealing with our own issues and circumstances. David urges the people of God not to get caught up in worrying about the wicked and those "others", but rather to trust in God and to put our lives into God's hands. Solid advice I think! Stop worrying about other people and turn to your Saviour. TRUST in him. There are so many fantastic Psalms. It is impossible to choose only 1 for the sake of these daily blogs, so I will have to cheat and choose a few more. Today's Psalm speaks of the brilliance of God. I like the way that Eugene Peterson encourages us to Praise God with those words - God, Brilliant Lord. 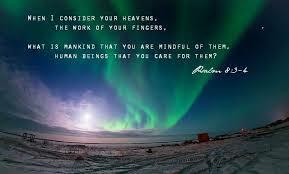 It reminds me that God is so incredible and amazing that our human words are just not enough to describe our Saviour. Job - no more words! The suffering of Job is well documented and many people feel a great kinship with the man who suffered greatly in his time. Job had to endure things that would break many of us, but he kept wrestling with God, his friends and life. His suffering became his greatest teacher and in the end, God restores to Job everything he lost (and more). Job had a lot of questions for God, but in the end, he realised he couldn't out-think or out-reason God. He needed to rest in the Infinite wisdom of his heavenly father. These words show us Job's reponse to God. Sometimes we just have to trust in God's wisdom and His ways. 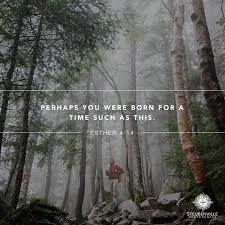 Esther - Such a time as this? If we keep looking towards the future, we may miss out on the blessings of the present. If we keep looking to the past, we may carry unneccessary burdens into today. The greatest challenge for us is to reflect on why God has allowed us to be alive for the PRESENT. Is it possible that we were created for such a time as this? What are you going to do about the challenges that lie ahead? Carrying on with the theme of yesterday - rebuilding when faced with opposition - it is interesting to note that Nehemiah faced similar trials as Ezra. There were many people who tried to distract them from rebuilding the walls of Jerusalem, but in the end God helped them prevail. This verse sums up the hard work and focussed stewardship of Nehemiah and his team. The hard work of the people, coupled with the HELP of God, ended up in a great victory and the task was completed. We would be wise to remember that anything worthwhile will take time and a huge effort if we want to succeed in that task. If it is worth it, then it is worth the pain and hardship to accomplish the goal. Keep at it! 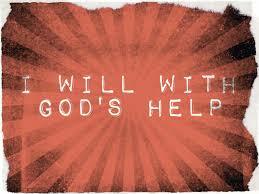 God will help you complete the task. Ezra records how the people of Israel had to deal with lots of trouble and hardship as they tried to rebuild the Temple. There were people who pretended that they wanted to help, but actually just wanted to distract and disrupt the good work. These local residents did all the could to DISCOURAGE the people of Judah, but in the end God helped them to finish the task. 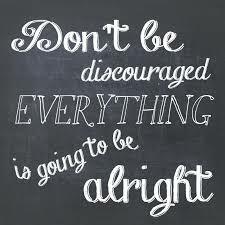 So, next time you are discouraged from your task or other people tried to distract you, remember who you are doing it for and trust in God's protection. Even though people may try and frighten us from the work, we need to persevere until the end! No plans of God can be frustrated! The book of 2 Chronicles is not one we often turn to when we are looking for the Promises of God, yet it contains one of the most well known passages in the Bible. These words are as appropiate in today's world as they were when they were written. The contain a wonderful promise, as well as a poignent reminder for us to follow God's ways. I am not sure if you have noticed that last line before? Read it again - it is wonderful! I will always watch over it, for it is dear to my heart. God says that we are dear to his heart! That is something to cherish today. Believe it and be blessed by it! Sometimes a song says it best! There is incredible emotion in the melody of a song and when the lyrics compliment the music, then the song becomes deeply meaningful. In order to thank God for the amazing blessings he had received David wrote many songs. We know that most of them are recorded in the Psalms, but there are a few scattered throughout other parts of the Old Testament. The words of today's song are found in the book of 1 Chronicles. As you read them I pray that they would make your heart glad and that you would be moved to offer your own praise to the Lord. 35 Cry out, “Save us, O God of our salvation! We don't find it easy to ask for help do we? We think it may be seen as a sign of weakness or that we aren't coping, but in truth, we NEED to ask for help at times. When King Hezekiah was confronted with a grave threat from his enemies he turned to God for help. This showed his great humility and willingness to place his trust in God. We could all learn from his example - asking for help is not a sign of weakness, but of greater TRUST. "Bend down, O Lord, and listen! Open your eyes, O Lord, and see! Listen to Sennacherib’s words of defiance against the living God. 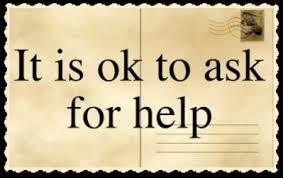 Remember it is OK to ask for help. If you were invited to ask for anything that you want - what would you ask for? It is actually a tough question, but the more you think about it, the more things come to mind. It is a legendary account of Solomon's response to the offer made to him by God. "What do you want? Ask, and I will give it to you!" Solomon replied, “You showed great and faithful love to your servant my father, David, because he was honest and true and faithful to you. And you have continued to show this great and faithful love to him today by giving him a son to sit on his throne. May we also learn to ask God for wisdom how to handle the troubles of life and then courage to deal with all the challenges that come our way. John Maxwell - "A man must be big enough to admit his mistakes, smart enough to profit from them, and strong enough to correct them."